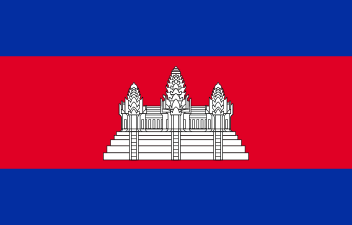 Phnom Penh Khmer is spoken in the capital and surrounding areas. This dialect is characterized by merging or complete elision of syllables, considered by speakers from other regions to be a "relaxed" pronunciation. For instance, "Phnom Penh" will sometimes be shortened to "m'Penh". Another characteristic of Phnom Penh speech is observed in words with an "r" either as an initial consonant or as the second member of a consonant cluster (as in the English word "bread"). The "r", trilled or flapped in other dialects, is either pronounced as a uvular trill or not pronounced at all. This alters the quality of any preceding consonant, causing a harder, more emphasized pronunciation. 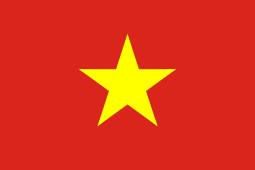 Another unique result is that the syllable is spoken with a low-rising or "dipping" tone much like the "hỏi" tone in Vietnamese. For example, some people pronounce /trəj/ ('fish') as [təj]: the /r/ is dropped and the vowel begins by dipping much lower in tone than standard speech and then rises, effectively doubling its length. Another example is the word /riən/ ('study'), which is pronounced [ʀiən], with the uvular "r" and the same intonation described above. Khmer Khe is spoken in the Se San, Srepok and Sekong river valleys of Sesan and Siem Pang districts in Stung Treng Province. Following the decline of Angkor, the Khmer abandoned their northern territories which were then settled by the Lao. 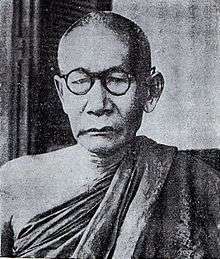 In the 17th century, Chey Chetha XI led a Khmer force into Stung Treng to retake the area. The Khmer Khe living in this area of Stung Treng in modern times are presumed to be the descendants of this group. Their dialect is thought to resemble that of pre-modern Siem Reap. Just as modern Khmer was emerging from the transitional period represented by Middle Khmer, Cambodia fell under the influence of French colonialism. Thailand, which had for centuries claimed suzerainty over Cambodia and controlled succession to the Cambodian throne, began losing its influence on the language. In 1887 Cambodia was fully integrated into French Indochina which brought in a French-speaking aristocracy. This led to French becoming the language of higher education and the intellectual class. By 1907, the French had wrested over half of modern-day Cambodia, including the north and northwest where Thai had been the prestige language, from back Thai control and reintegrated it into the country. In addition, there are diphthongs and triphthongs which are analyzed as a vowel nucleus plus a semivowel (/j/ or /w/) coda because they can not be followed by a final consonant. These include: (with short monophthongs) /ɨw/, /əw/, /aj/, /aw/, /uj/; (with long monophthongs) /əːj/, /aːj/; (with long diphthongs) /iəj/, /iəw/, /ɨəj/, /aoj/, /aəj/ and /uəj/. Although most Cambodian dialects are not tonal, colloquial Phnom Penh dialect has developed a tonal contrast (level versus peaking tone) to compensate for the elision of /r/. Compounding in Khmer is a common derivational process that takes two forms, coordinate compounds and repetitive compounds. Coordinate compounds join two unbound morphemes (independent words) of similar meaning to form a compound signifying a concept more general than either word alone. :296 Coordinate compounds join either two nouns or two verbs. Repetitive compounds, one of the most productive derivational features of Khmer, use reduplication of an entire word to derive words whose meaning will depend on the class of the reduplicated word. :185 A repetitive compound of a noun indicates plurality or generality while that of an adjectival verb could mean either an intensification or plurality. Khmer nouns do not inflect for grammatical gender or singular/plural. There are no articles, but indefiniteness is often expressed by the word for "one" (មូយ, /muəj/) following the noun as in ឆ្កែមូយ (/cʰkae muəj/ "a dog"). Plurality can be marked by postnominal particles, numerals, or reduplication of a following adjective, which, although similar to intensification, is usually not ambiguous due to context. Adjectives, verbs and verb phrases may be made into nouns by the use of nominalization particles. Three of the more common particles used to create nouns are /kaː/, /sec kdəj/, and /pʰiəp/. :45–48 These particles are prefixed most often to verbs in order to form abstract nouns. The latter, derived from Sanskrit, also occurs as a suffix in fixed forms borrowed from Sanskrit and Pali such as /sokʰa.pʰiəp/ ("health") from /sok/ ("to be healthy"). A complete Khmer sentence consists of four basic elements which include an optional topic, an optional subject, an obligatory predicate and various adverbials and particles. The topic and subject are noun phrases, predicates are verb phrases and another noun phrase acting as an object or verbal attribute often follows the predicate. There are three basic types of questions in Khmer. :46 Questions requesting specific information use question words. Polar questions are indicated with interrogative particles, most commonly /teː/ a homonym of the negation particle. Tag questions are indicated with various particles and rising inflection. :57 The SVO word order is generally not inverted for questions. Counting in Khmer is based on a biquinary system (the numbers from 6 to 9 have the form "five one", "five two", etc.) However, the words for multiples of ten from 30 to 90 are not related to the basic Khmer numbers, but are probably borrowed from Thai. The Khmer script has its own versions of the Arabic numerals. 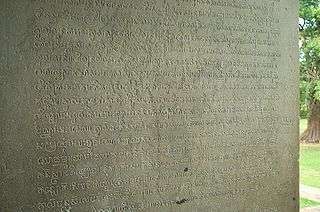 Khmer is written with the Khmer script, an abugida developed from the Pallava script of India before the 7th century when the first known inscription appeared. Written left-to-right with vowel signs that can be placed after, before, above or below the consonant they follow, the Khmer script is similar in appearance and usage to Thai and Lao, both of which were based on the Khmer system. The Khmer script is also distantly related to the Mon script, the ancestor of the modern Burmese script. Khmer numerals, which were inherited from Indian numerals, are used more widely than Hindu-Arabic numerals. Within Cambodia, literacy in the Khmer alphabet is estimated at 77.6%. ↑ Hammarström, Harald; Forkel, Robert; Haspelmath, Martin; Bank, Sebastian, eds. (2016). "Khmeric". Glottolog 2.7. Jena: Max Planck Institute for the Science of Human History. 1 2 David A. Smyth, Judith Margaret Jacob (1993). Cambodian Linguistics, Literature and History: Collected Articles. Routledge (UK). ISBN 978-0-7286-0218-2. ↑ Hul, Reaksmey; Woods, Ben (3 March 2015). "Campaign Aims to Boost Adult Literacy". The Cambodia Daily. Retrieved 7 February 2016. 1 2 3 Diffloth, Gerard & Zide, Norman. Austroasiatic Languages. ↑ Thomas, David (1964). "A survey of Austroasiatic and Mon-Khmer comparative studies". The Mon-Khmer Studies Journal. 1: 149–163. Retrieved 19 June 2012. 1 2 Sidwell, Paul (2009a). The Austroasiatic Central Riverine Hypothesis. Keynote address, SEALS, XIX. ↑ Sidwell, Paul (2006). "Khmer/Cambodian". Mon-Khmer.com. Australian National University. Archived from the original (lecture) on 2011. Retrieved 6 February 2016. ↑ Nancy Joan Smith-Hefner (1999). Khmer American: Identity and Moral Education in a Diasporic Community. University of California. ISBN 0-520-21349-1. ↑ Wayland, Ratree; Jongman, Allard (2003). "Acoustic correlates of breathy and clear vowels: the case of Khmer" (PDF). Journal of Phonetics. 31: 181–201. doi:10.1016/s0095-4470(02)00086-4. Retrieved 6 February 2016. 1 2 Sidwell, Paul (2009). Classifying the Austroasiatic languages: history and state of the art. LINCOM studies in Asian linguistics, 76. Munich: Lincom Europa. ↑ Ferlus, Michel. 1992. Essai de phonétique historique du khmer (Du milieau du primier millénaire de notre ère à l'époque actuelle). Mon–Khmer Studies 2 (6):7–28. ↑ Olivier, Bernon de (1988). Cholticha, Bamroongraks; Wilaiwan, Khanittanan; Laddawan, Permch, eds. "Khmer of Surin: Lexical Remarks" (PDF). The International Symposium on Language and Linguistics. Bangkok, Thailand: Thammasat University: 258–262. Retrieved 6 February 2016. ↑ William Allen A. Smalley (1994). Linguistic Diversity and National Unity: Language Ecology in Thailand. University of Chicago. ISBN 0-226-76288-2. ↑ Thach, Ngoc Minh. Monosyllablization in Kiengiang Khmer. University of Ho Chi Minh City. ↑ Try, Tuon; Chambers, Marcus (2006). "Situation Analysis" (PDF). Stung Treng Province Cambodia, IUCN, MRC, UNDP: 45–46. Retrieved 20 January 2016. ↑ Hammarström, Harald; Forkel, Robert; Haspelmath, Martin; Bank, Sebastian, eds. (2016). "Old Khmer". Glottolog 2.7. Jena: Max Planck Institute for the Science of Human History. 1 2 Sak-Humphry, Channy. The Syntax of Nouns and Noun Phrases in Dated Pre-Angkorian Inscriptions. Mon Khmer Studies 22: 1–26. 1 2 3 Harris, Ian (2008). Cambodian Buddhism: History and Practice. Hawaii: University of Hawaii Press. ISBN 0-8248-3298-1. 1 2 Chandler, David P. (1992). A history of Cambodia (2, illustrated ed.). Westview Press. ISBN 0813309263. 1 2 Sasagawa, Hideo (2015). "The Establishment of the National Language in Twentieth-Century Cambodia: Debates on Orthography and Coinage" (PDF). Southeast Asian Studies. 4 (1). Retrieved 6 February 2016. 1 2 3 4 Minegishi, M (2006). "Khmer". In Keith Brown. Encyclopedia of Language and Linguistics (2 ed.). Elsevier. pp. 4981–4984. ↑ Jacob, JM (2002). "The Structure of the Word in Old Khmer". In VI Braginskiĭ. Classical Civilizations of South-East Asia: Key Papers from SOAS. Routledge. ↑ International Encyclopedia of Linguistics, OUP 2003, p. 356. ↑ Minegishi, Makoto (1986). "On Takeo Dialects of Khmer: Phonology and World List" (PDF). Retrieved 2008-12-04. ↑ Wayland, Ratree. "An Acoustic Study of Battambang Khmer Vowels." The Mon-Khmer Studies Journal. 28. (1998): 43–62. ↑ Jacob, Judith M (1976). "An Examination of the Vowels and final Consonants in Correspondences between pre-Angkor and modern Khmer" (PDF). Pacific Linguistics. 42 (19): 27–34. Retrieved 27 January 2016. 1 2 3 4 5 6 7 8 9 10 11 12 13 14 15 16 17 18 19 20 21 22 23 24 25 26 Huffman, Franklin (1970). Modern Spoken Cambodian (1998 ed.). Ithaca, NY: Cornell Southeast Asia Program Publications. ISBN 0877275211. ↑ Nacaskul, Karnchana (1978). "The syllabic and morphological structure of Cambodian words" (PDF). Mon-Khmer Studies Journal. 7: 187. Retrieved 24 January 2016. ↑ Schiller, Eric (1994). "Khmer Nominalizing and Causitivizing Infixes" (PDF). University of Chicago. Retrieved 2008-12-04. 1 2 3 Jacob, Judith M (1991). "A Diachronic Survey of some Khmer particles (7th to 17th centuries)" (PDF). Essays in honour of HL Shorto. 1991: 193. Retrieved 24 January 2016. ↑ Huffman, Franklin. 1967. An outline of Cambodian Grammar. PhD thesis, Cornell University. 1 2 3 4 5 6 7 8 9 10 11 12 13 14 15 16 17 18 19 20 21 22 23 24 25 26 27 28 29 30 31 32 33 34 Haiman, John (2011). Cambodian: Khmer (London Oriental and African Language Library, Book 16). John Benjamins Publishing Company. ISBN 9027238162. Retrieved 27 January 2016. 1 2 Jacob, Judith (1968). Introduction to Cambodian (School of Oriental and African Studies). Oxford University Press. ISBN 0197135560. 1 2 David Smyth (1995). Colloquial Cambodian: A Complete Language Course. Routledge (UK). ISBN 0-415-10006-2. ↑ Karnchana, Nacaskul (1978). "The syllabic and morphological structure of Cambodian words" (PDF). Mon-Khmer Studies Journal. 3: 183–200. Retrieved 6 February 2016. ↑ Moravcsik, Edith M. (1993). "Why is Syntax Complicated". In Mushira, Eid; Iverson, Gregory. Principles and Prediction: The analysis of natural language. Papers in honor of Gerald Sanders (Volume 98 of Current Issues in Linguistic Theory). John Benjamins Publishing. pp. 73–74. ISBN 9027276978. 1 2 Ehrman, Madeline Elizabeth; Kem, Sos; Lim, Hak Kheang (1974). Contemporary Cambodian: Grammatical Sketch. Foreign Service Institute, US Department of State. ↑ Mori, K. (2007). Soichi, I., ed. "Khmer final particles phɔɔŋ & dae" (PDF). SEALS XIII Papers from the 13th Annual Meeting of the Southeast Asian Linguistics Society 2003. Canberra, Australia: Pacific Linguistics, Research School of Pacific and Asian Studies, The Australian National University: 139–149–6. Retrieved 6 February 2016. ↑ Jacob, Judith M (1965). "Notes on the numerals and numeral coefficients on Old, Middle, and Modern Khmer". Lingua. 15: 144. Retrieved 24 January 2016. ↑ United Nations in Cambodia "Celebration of International Literacy Day, 2011"